AWR enables you to have full control over the type of search results to be retrieved from Google with an in-depth customization level of the monitoring options. Country - enables you to select the country from which the ranking data should be retrieved from. 💡 Quick tip: If you need monitoring ranking positions across various international markets, a search engine must be defined for each country. Adding more than 1 version of the Google search engine increases the number of keyword units required to update the project. More details on how keyword units are calculated can be found in this article. Search engine - allows selecting the search engine that will be queried using the keywords added to the project. Device - allows retrieving the rankings for searches performed on Desktop, respectively on Mobile devices. 💡 Quick tip: In AWR search results are tracked separately by device. If you need tracking keyword rankings from searches performed on both Desktop and Mobile devices, you will have to define 2 search engines, one for each type of Google searches. Search type - a Google search engine can be defined to either track ranking positions from regular web search (All) or only on specific verticals such as Images, Videos, Maps or News. 💡 Quick tip: Both Videos and Maps search engines require a custom alias setup, so that ranking positions can be reported. More details can be found in the Website alias setup article. SERP features - when defining the search engine to track pages from Google’s regular web search network, you can select which type of results from SERPs should be considered when computing the ranking positions. Universal - all types of web search results (except ads) from Desktop, respectively Mobile SERPs are being considered. When tracking a Universal search engine any URL on which a searcher can click is considered as being a competitor and counted when computing the ranking position. Featured Snippets, local 3- pack, desktop local knowledge, mobile AMP results and other types of results returned for desktop, respectively mobile searches are captured using the Universal search engine. Organic - only the organic entries from regular web search pages are being considered. When tracking an Organic search engine, the other types of results displayed in SERPs are being ignored when computing the ranking position of an URL. Organic and Places - both organic and local 3-pack listings are being tracked. 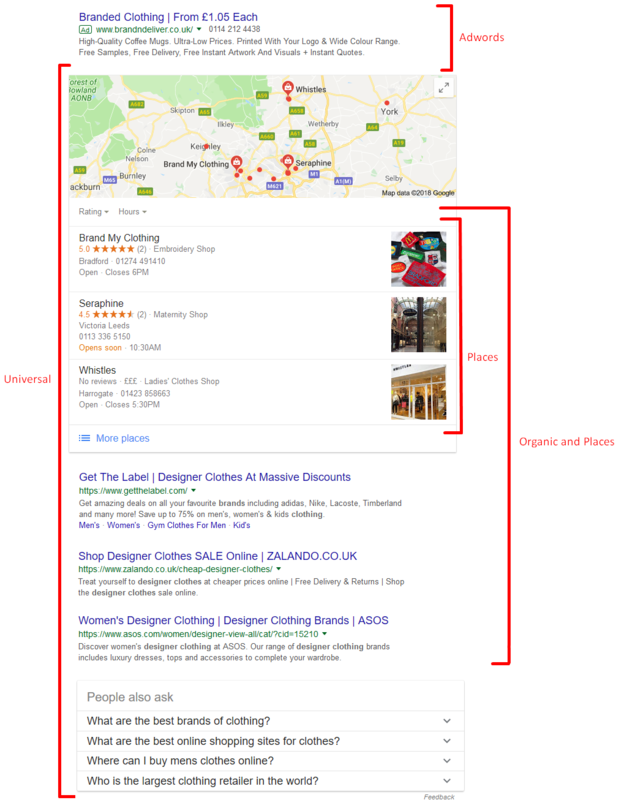 Places - only the listings from the Google’s local-3 pack box are being considered. 💡 Quick tip: Places search engines require setting up a custom alias. More details can be found in the Website alias setup article. Adwords - only sponsored search results are being returned. 💡 Quick tip: The last 3 search options - Organic & Places, Places and Adwords - are available only for searches performed on Desktop devices. For more details on how to set up AWR to track the most relevant results for your business you can also check the Explore Google search preferences video tutorial . 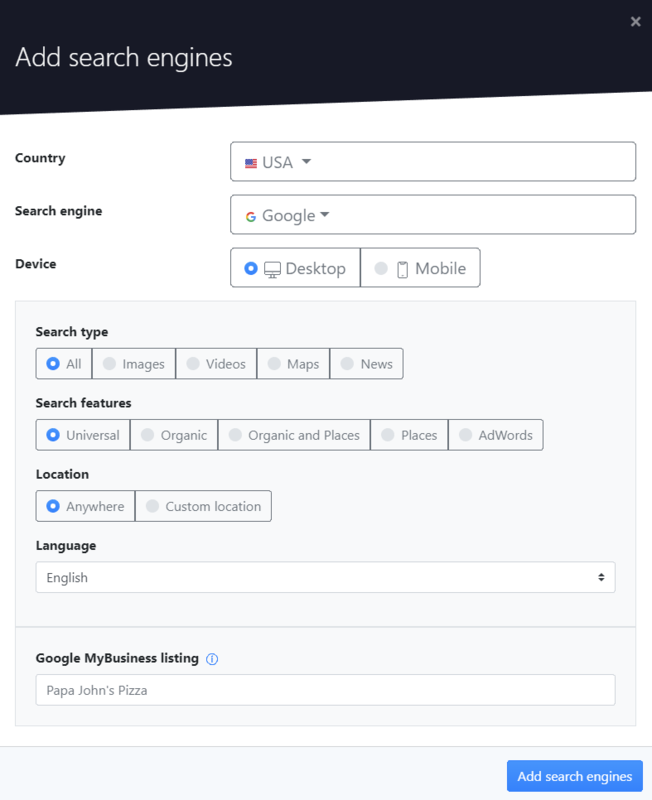 Location - allows retrieving the rankings either for a specific country by leaving the search engine to anywhere or to narrow the ranking process down to a region or even a zip code when selecting the custom location option. Language - allows you to filter the search results and retrieve the rankings only from searches performed in the language selected. 💡 Quick tip: The keyword queries added to the projects should be in the same language as the one selected at the search engine level. After inserting a Google search engine to the project, the monitoring preferences can no longer be edited back from user end.